There were benefits to being GM. Rush out on stage in a bold new outfit, and get laughed right off it? No problem, just run back to the costume department, where they’ll find you a tried and proven one, and the master seamstresses will nip and tuck it to fit your size A-body in a flash. The 1978 Aeroback A-Bodies (CCCCC Part 9) were a royal flop; it didn’t take long for that to become self evident. Some might have even foreseen it. But adapting the 1975 Seville’s tried-and-proven Saville-row tailored suit was a quickie fix. And a fabulously successful one. For eight years (1980-1987) we were given the chance to amend our sins for not having bought one of the originals. And very many did. “The Little Limousine” is what I remember it being called; was it in an ad or a review? But that sticks in my head, although it’s less honest than just calling it a Little Seville. But what’s honesty got to do with this business? Of course “little” may not have been the right word, exactly. The A-Bodies did have six inches less wheelbase than the Seville’s 114″ stretched Nova X platform, but from the looks of it, that was all in getting the front wheels out front. The passenger compartments were more similar sized; with the nod undoubtedly going to the A-Bodies for better interior space utilization. 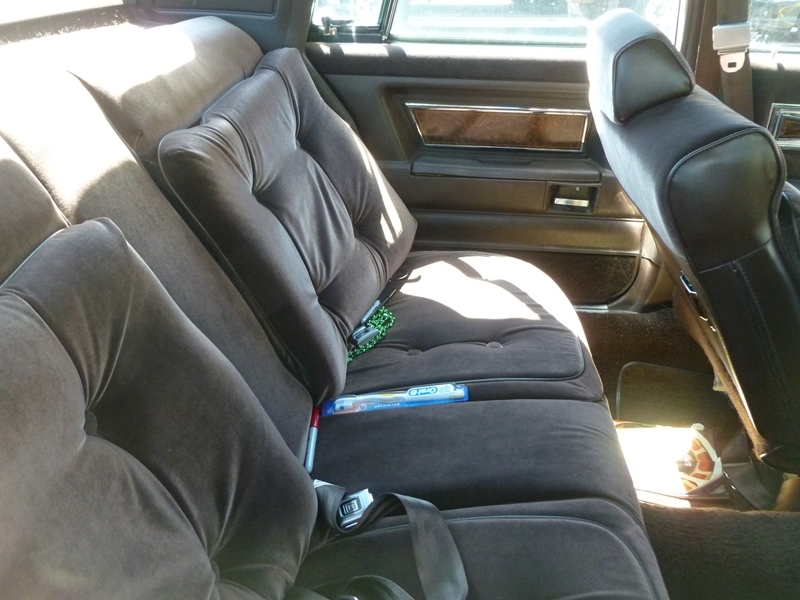 This interior is from a genuine Brougham edition of the Cutlass Supreme, and it is a cushy cabin indeed. No wonder folks kept buying them for so long, despite the lack of opening rear windows. By that time, everyone had their A/C, and didn’t care anymore. Not really a spacious car, but adequate. And although the Cutlass RWD platform was getting a bit long in tooth towards the end of its career, it was a more modern and space-efficient design than its competitor in the evergreen RWD not-too-big brougham market, the Chrysler Fifth Avenue. For good measure, here’s a peek into the cabin of a mere Cutlass Supreme. The upholstery is generic grade, and the plasti-wood rearranged, but it’s still not an unpleasant place to sit; kind of like a doctor’s office waiting room. Where’s the magazine rack? 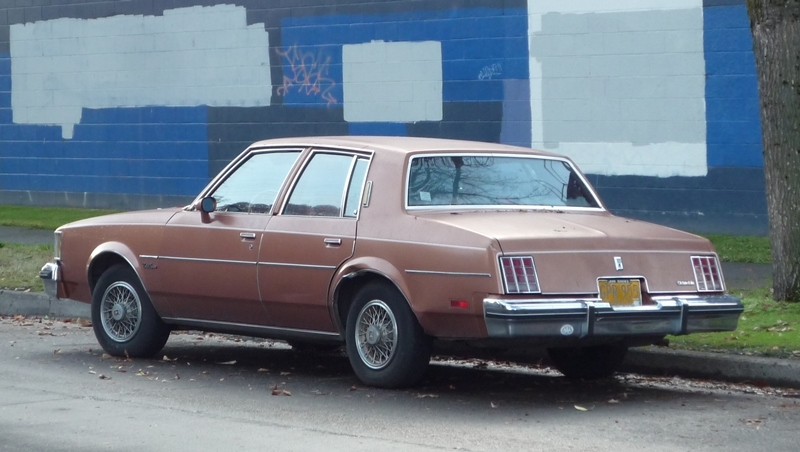 Yes, these Cutlass Supreme Seville mini-me sedans were everywhere, if you actually looked. They were as much of the backdrop of the street-scape for so long, it seems odd to realize that not every sixth car is one anymore. Familiarity can breed contempt. But fear not: there’s still a healthy sprinkling of them around, as this little sampler shows. Like most cars that get built a long time, the later ones seem pretty solidly screwed together indeed. All of these have a Volvo-esque perpetual youthfulness to them. Or maybe their owners are Cutlass-proud. Engines: let’s forget about them today. Did anyone who bought one of these really care about what was under the hood, as long as it was unobtrusive? Nah. Any slightest pretense of performance and sportiness had long been purged from the Cutlass Supreme playbook. Soft and silky; cushy and whooshy; that’s all that counted. A quiet and sedate ride to the dentist office or supermarket. Not surprisingly, the 1981 Seville pretty much had to ditch that look it had started in 1975, as it was absolutely everywhere. So what did the GM stylists do? Give it a flowing fastback, with a little bustle; not all that different from the Aeroback Cutlass in its general outline. What goes around, comes around. Well, that turned out not to be such a hot idea, unless you’re a Wayne Kady fan. Live and learn, or not. What else is there to say? Hmmm; your turn. My dad had an 83 Cutlass Cruiser wagon with the 3.8 liter Buick um… powerplant? Lemon yellow with Woodgrain and a combo olive green/tan interior. It served us well, bought it in 1986 and traded it in in 1993. But she was used up at the end, that car had absolutely nothing left to give. GM wanted to preserve hip room on these things, since they were considerably narrower than the previous mid-sized cars. So they made the windows stationary. Even as a kid, I giggled whenever I read the brochures for them; Buick tried to make it sound like it was luxurious to have rear windows that didn’t roll down. Yet on the X-cars, they were not stationary. Yup. Take a look at one of the above interior photos and you can see how the rear arm rests are recessed into the doors, thus allowing maximum rear seat width but intruding into where the window mechanism would reside. The wagons built on this body have a sort of similar quirk. The taillights are in the bumper so that the tailgate can be the full width of the car. Did the Seville get opening rear windows? First generation Seville rear windows retracted. 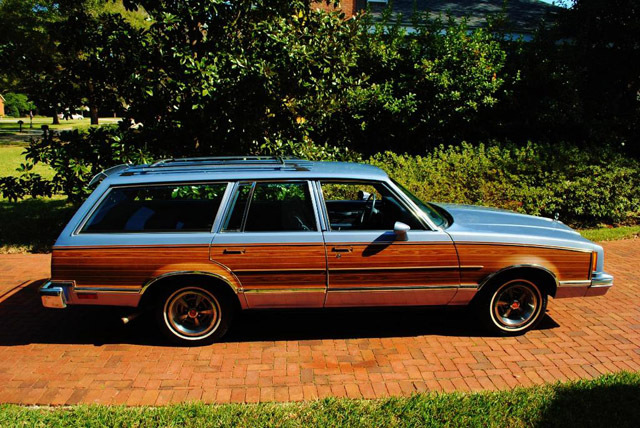 My grandparents bought a brand new ’82 Malibu Classic Estate wagon, in February of that year. It was a sharp looking car, a deep, dark metallic blue with fake woodgrain. It had crank windows. Well, being wintertime, nobody even thought about hopping in the back seat and rolling down a window. Also, this Malibu had replaced a ’72 Impala 4-door hardtop, so they were used to being able to roll windows down…and down all the way! Well, one warm day in April, I went to church with Grandmom and Granddad, and Grandmom sat in the back seat. She started fumbling around, looking a bit perplexed, and finally said “How in the hell do you put down the damn window? 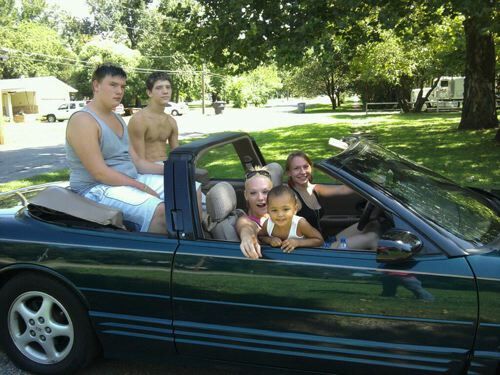 !” We looked around, and that’s when it dawned on us that you DIDN’T roll down the back windows. You just had those little flip out vent windows. As others have mentioned, these windows were stationary because the door panels had recessed armrests, which did help a lot with interior room. They probably had more hip room (or whatever the measurement is when they go armrest-to-armrest), than the full-sized car that had stick-out armrests. GM also tried hard to jettison as much weight as possible on these cars when they downsized them. I think they were trying to push the envelope with downsizing and weight savings, compared to what they did the previous year when they downsized the big cars. So, they experimented with things like stationary door windows, compact spare tires, and so on. The scope of the shrinkage was also greater. In 1977, for example the Impala lost about 9-10 inches, and 5.5″ in wheelbase. The ’78 Malibu sedan, in contrast, lost about 19″ in length and 7.9″ in wheelbase. I remember reading a writeup on these downsized cars, that mentioned GM had done wind tunnel and air-flow testing and such, and they discovered that you got better air flow with the vent windows than you would have with a roll-down door window in back. However, I always wondered what kind of roll-down window they would have compared it to? On the models that had the vent in the door (wagons and sedans with the more formal roof), that window would have rolled down maybe half-way, if they were lucky. But on the models that had the vent in the C-pillar, and no quarter window in the door, they wouldn’t have been able to get that window to open more than a couple inches, as it was a huge window, in relation to the space available for it to roll down into. Interestingly, Chrysler tried putting stationary rear windows in their 1981 K-car sedans and wagons, with a flip-out quarter window for a vent. However, customers complained about it, and they did a cost study that revealed they weren’t really saving much money by eliminating the roll-down window. So, partway into the 1982 model year, they made them roll down. By that time, they also had the LeBaron and Dodge 400, which I think always had roll-down windows. So it was probably cheaper to just make them all roll down, rather than have some roll down and have some stationary. I’d imagine a lot of people complained about the GM windows as well. However, the GM cars were more expensive, and more likely to have air conditioning, so buyers were probably more willing to tolerate it. Plus, GM could simply get away with stuff back then, that Chrysler, or Ford, could not! 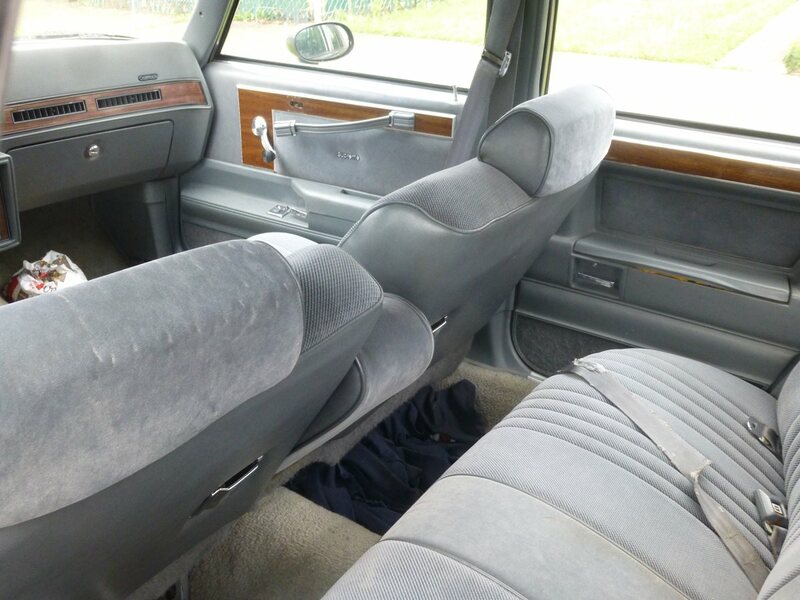 Even though one reason GM did those recessed armrest was to increase hip room, even if they hadn’t, those cars still would still have been wider across inside at that point then cars like the LeBaron/Diplomat, Fairmont/Zephyr, GM’s own Nova and its clones, and especially the Granada/Monarch. However, these cars also had to compete, initially with the likes of the LTD/Cougar and Fury/Monaco…cars that, while less space efficient inside, still had more generous shoulder room. I kinda have a loathe relationship with these particular Cutlasses. A large number of them were equipped with the 3.8L 2 barrel “OPEC Crisis” V6 (I’d even say that at least 45% of them were sold like that) GAWD did that thing ever just wheeze. The carb was nothing more than an inhaler to provide relief to that engine, since every stab of the gas pedal was giving it an asthma attack. And out of the remaining domestic Mid Size RWDs I kinda give a nod to the 83-86 LTD/Marquis as being more modern, and perhaps more tasteful (and quiet). The 3.8 Essex didn’t holler as much when spurred. And those were available as wagons up to the end of their lives. And were outgrowths of the genuinely better Fairmont. Then again Oldsmobile had it’s last Million unit production peak in 1985, so this might have been the last brand equity peak before they slid into old peoples oblivion. I had an 86 Fox-body Marquis wagon that was a really nice car. The wagons were attractive, the sedans not so much. 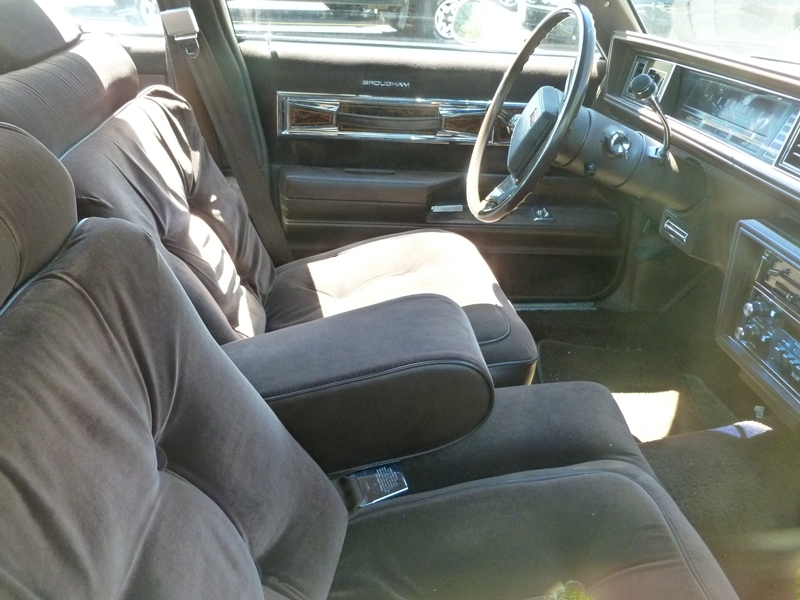 And while the interiors were nice, they were not quite as nice as the Cutlass if you wanted to do full-out Brougham. In truth, I would have been more of a 5th Avenue/Diplomat kind of guy, but I know that I don’t have all that much company. A nice Fury/Diplomat would give a high-end Cutlass a run for its money for a comfy interior, and the Chrysler version took it up another notch or two.. I think that these Cutlass sedans made up about 40% of the new car registrations in midwestern rural counties in those years (Caprices, 88s Panthers and pickups made up the rest). If these eventually came with the 307 V8, it would probably get up and move fairly well. In truth though, these only became mildly attractive to me when the big Olds and Buick B and C bodies went away after 84-85. When I was in a carpool in 1987-89, one of the riders had a 1983 Cutlass Supreme coupe with the V-8. It wasn’t especially fast, and under full throttle it sounded coarse and felt rough. It definitely wasn’t anything like the Rocket V-8s of legend in that regard. The owner wasn’t too religious about regular maintenance…according to her, one time she checked the oil, only to discover that it was almost gone! And the car had well over 100,000 miles on the odometer (granted, mostly highway miles), so it was reliable. 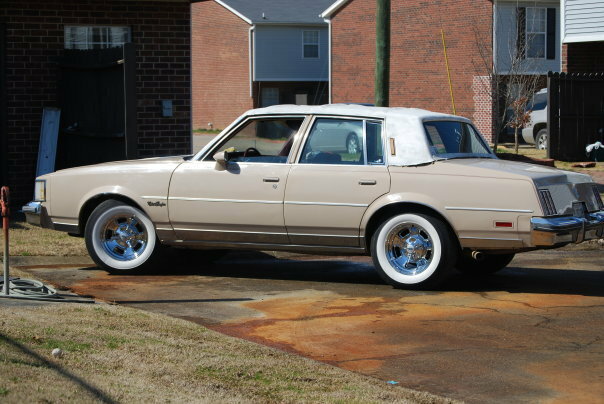 My Uncle still has a 1984 Ninety Eight with the 307, and there were multiple 307 equipped Cutlass Coupes in the family. The 3.8 Sedans were reserved for Wives grocery duties and hand-me-down cheap to insure first cars for kids. The 307 powered cars seemed “Competent”: Not exactly thrilling, but par for the times. I would guess most of the pep was “all in the gearing” but they happily cruise the interstate at 85 all day long. I know the 4-4-2 Cutlasses with the 180hp 307 can hit 0-60 in the low 9s, I’d think the 140hp ones would be good for mid 11 0-60s. I don’t think that dog of a 3.8 could smoke a well tuned 110hp Corvair. Or a Post Emissions 250 equipped Nova for that matter. A contemporary Ford 302 seems livelier and more playful, a Diplomat/Fury/Fifth Avenue 318 smoother, but the low to mid 20s mpg the 307 turns out in Freeway cruising makes it seem like it was a good compromise. I think it could have been a better engine if it was developed beyond 1983. I don’t think it needed to be an engineering dead end. I was guessing on the 307. I had that engine in an 84 Ninety Eight Regency and in an 89 Cad Brougham. Those cars were mighty -ahem- relaxed, but I always figured that if you could get rid of 1000 pounds, the engine wouldn’t be bad. I guess my problem with these Cutlasses is the same one I have with my Mother’s 06 LaCrosse that I am driving right now as she recovers from knee surgery: I don’t mind a car that floats and plows like a big car as long as it really is a big car. If I am going to give up all the bulk and room, I would rather have something a little livelier in the accelleration and handling departments. This is where GM’s midsize and smaller offerings have always failed me. Yeah, I have to say a lot of the times the W bodies that replaced these felt as brick like and unwieldy as the cars they replaced. (especially the base models with soft springing). But then again the W’s aren’t really all that much smaller (at least in length, and in some cases weight) than these A/Gs, and when the Sedans debuted in 1990-91 they were sometimes longer than the “Full Size” C/H front drivers, all of but the DeVille during those years were under 200 inches long and about 3500lbs. I know the original Lumina was the longest of the Ws at over 200 inches, but it didn’t bump into any C or H body, since the Caprice was the full sizer at Chevy. I think that lead to another issue with Buick and Oldsmobile in particular: For nearly half a decade they offered 3 sedans that were within a few inches of being the same size. Why do we need 6 middle market cars that aren’t necessarily unique in purpose? The W bodies noticeably for their size also repeat a mistake of these A/Gs, they aren’t particularly roomy or comfortable inside (the rear seats are too close to the floor) compared to the H bodies. The next in the series will be the most interesting, as it seems the 1988-97 Cutlass Supremes were the answer to a question no one answered. Even if I’d still take one of the Convertibles: 1995, Dark Green with a Tan top, please! In 1983, GM wasn’t putting 4-speed automatics in their midsized cars yet, so in an attempt to get better fuel economy, they tended to put extra tall axle ratios in the V-8/3-speed automatic cars. I have a 1985 Consumer Guide auto issue, and it tested an ’85 Cutlass Supreme with that setup. It lists the axle ratio as a 2.14:1. Unless that’s a typo? 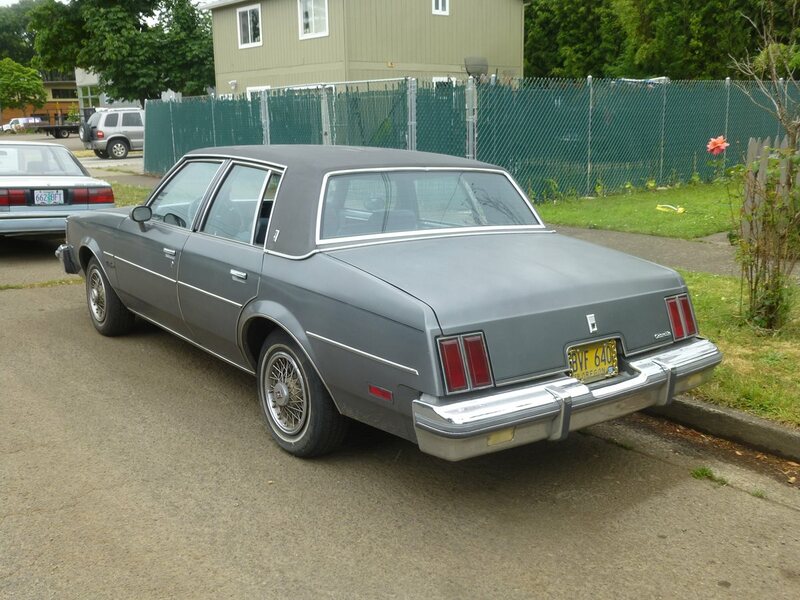 They also tested an ’85 Regal with the 231-2bbl and 3-speed automatic, and it’s listed as a 2.41:1. I think GM might have used more sound deadening and such, than their Ford/Mopar rivals, so that might have made them feel, and sound, a bit extra slow as well. When I was learning to drive, I logged a lot of time on Mom’s ’80 Malibu coupe, with a 229 V-6, and my grandparents’ ’85 LTD, which had the 232 Essex. The LTD definitely accelerated better and was more responsive in general. It was also easier to practice parallel parking in. But, overall I liked the Malibu better…it felt like a more solid, substantial car. Also felt roomier inside, although being a coupe, it probably had less interior room than the LTD did. These cars may have had a subframe up front. They definitely were not complete unit-body cars. I believe the rear windows did not go down because there was not enough room for the window to go down inside the rear doors. Looking at the cars in the photos it seems to me that the rear window could have been made to roll halfway down anyway – one would think that was the reason for the rear door vent window, to make the main window shorter so it could go down at least part way. I thought that the rear windows did go down starting with the 1980 models. GM jerry-rigged a roll-down mechanism in response to nearly universal customer complaints. The 3.8 V-6 used in these cars was not the long-lived and smooth version that became ubiquitous in various GM cars during the late 1980s and 1990s. A friend had a 1982 Cutlass Supreme coupe, and the engine grenaded at about 82,000 miles, which he later learned was a common occurrence with this engine. This car, along with the Buick version, dominated the intermediate sedan class in the early 1980s. As Paul says, in the early 1980s, these were virtually EVERYWHERE. The Cutlass and Regal were so popular, that GM attempted to turn the Cutlass Ciera and other A-bodies into front-wheel-drive versions of this car. The result wasn’t all that great. Ford, meanwhile, had been getting whomped by GM in this segment, so it had less to lose by turning in a completely new direction. Which it did with the 1986 Taurus/Sable, which made ALL of the GM entries seem old hat virtually overnight. As the owner of a 1987 sedan with every concieveable option, the rear windows most certainly DID NOT go down. 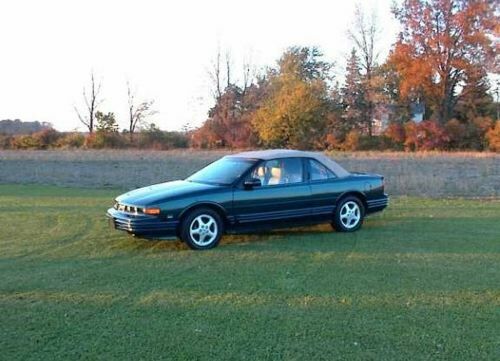 I don’t know if you’re just kidding around or simply don’t realize that the front wheel drive 1995 Cutlass shared nothing at all with the versions from 10 years prior. Nah, those back windows were stationary right up through the end. I think they simply started using the station wagon back doors when they went to the more formal roofline. One thing that might cause confusion though, is that power vent windows were an option, and those did away with the little chrome knob that you twisted to flip open the window. On 4-door models, at least by the early/mid 80’s, you had two power window options. The first was for just the front windows, and it was the same cost as for the coupes. The second option gave you power windows up front and power vents in back, and it was the same cost as getting power windows all around on a 4-door car with roll-down windows…a LeSabre or Century, for example. I don’t know if the older styles though, that had the vent windows in the C-pillar (’78-79 Century/Salon, ’78-80 Malibu/LeMans) offered power rear vents or not. I sold the car for $400, while it was still running, less than 1000 miles later. A couple of my friends needed it to help pass their driver’s test, so I held onto it until they got past that, at least. I had another car at the time, a ’68 Dodge Dart 270 hardtop with a non-stock 318, and failed power steering. No way my friends would pass the parallel parking test in that! Anyway, years later, I found out that what most likely happened was that those cars used some kind of nylon/mesh timing gear, to make the car quieter (and cheaper) but as these things failed, they’d spread metal shavings through the engine, and cause all sorts of issues. Also, the 3.8 in those days wasn’t a very strong engine. It was lightweight, and not all that durable. It also had a lot narrow, right-angle oil passages that would easily clog. Apparently, the turbo block was beefier, and did away with most, if not all, of those troublesome oil passages. For 1985, all versions of the 3.8 (the 110 hp 2-bbl, as well as the 125 hp fuel injected version) got the turbo block, and the engine went from being one of GM’s worst, to one of their best. And it only got better in later years, with the exception of those plastic intake manifolds for a few years. FWIW, when the engine in my Cutlass was dying, the mechanic I dealt with mentioned these were troubleprone, as well. I went to a local junkyard to see if they had any, but they said all of theirs were shot, as well, and that they’d never seen a 231 worth rebuilding. Everybody was telling me to dump that car. Shame, because it was actually a really nice car. It was a base model with the corduroy type cloth interior. But it had a landau top and the Olds Rally wheels. It was the light silvery green “Jadestone” metallic, and the wheels, top, and interior were all keyed to match. Very pretty car. Always wondered, if it had a V-8 engine, how much longer it would have lasted. By this time, I don’t think you could get a 307 in these cars. I know you could get an Olds 260, but I’ve also seen them with the Chevy 267. One of my grille sections, which were hinged, had broken off, and I found another ’82 in a junkyard. 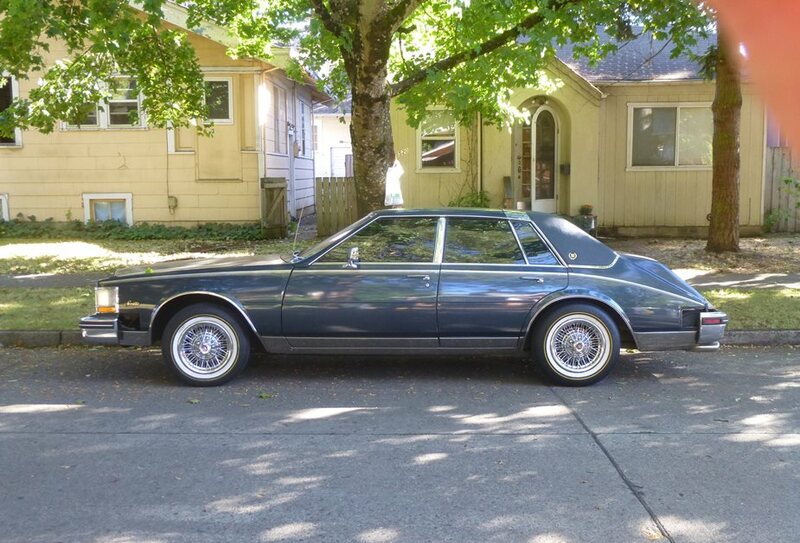 It was a Brougham though, which used a different grille, so I ended up having to buy both sections to make it match. That junkyard ’82 had a 267, according to the sticker under the hood. 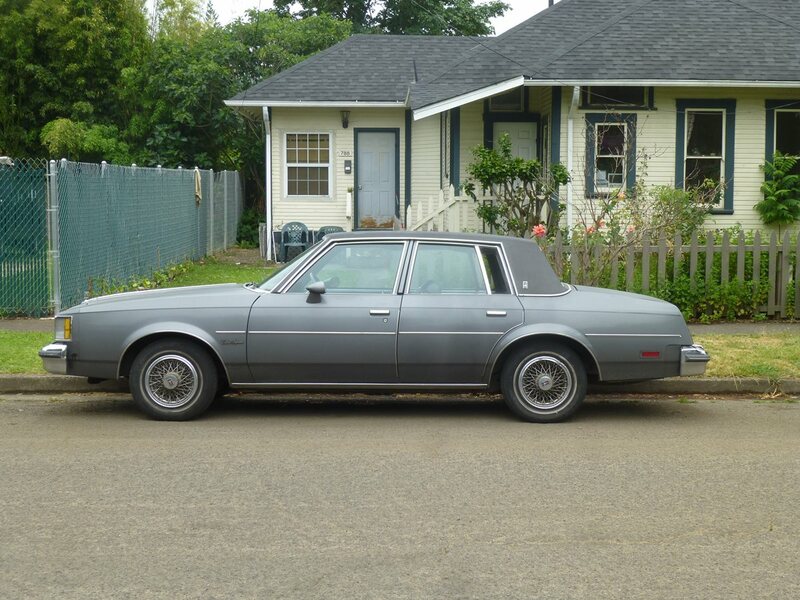 Hmmm….would I have chosen an A-body Brougham, or this Supreme if I was a new car buyer in, say, 1986? What was the price difference between a Supreme Brougham and a Ciera Brougham? Tough call. I’d have probably gotten the Ciera for fuel mileage, but secretly wanted the Supreme. The Ciera also had the more modern fuel injected version of the 3.8 V6 by 1986 with 140hp. Although it wasn’t as highly rated on surveys for initial quality or durability as it would towards the turn of the decade. But they were still aimed at more of a consumer audience at this point too (I’ve seen 86-88 Cutlass Ciera Cruisers with the 3.8L, Leather and Console Shift). I would have definitely taken a Cutlass Ciera Cruiser with those options over any of the RWD Cutlasses, or just gone whole hog and gotten a Custom Cruiser. I doubt the 307 was any less economical in that than it was in the Cutlasses. Yeah, any sane person would go Ciera by 1986 I’d think. My aunt had one about that vintage, a sedan with red leather. I was looking for a very cheap used car a couple years ago and test drove an ’89 (I think) which had a Chevy 2.8 V6 in it. I thought this was weird, but I guess they built them with that mill for a couple years. The owner had advertised it as a V8, which I thought was just a typo, but come to find out he literally thought it was a V8 and seemed sad when I introduced him to reality. They had owned it several years allegedly…how could he not know that?? The car was straight but worn, with faded paint though no rust. The interior had aged OK as they tend to do, nothing special but it was all still there and no tears etc. The scary part was the steering-inputs were a mere suggestion due to all the slop, the engine flopped around on what were almost certainly nonexistent mounts with the slightest throttle application, and every joint or moving part in the front end creaked, thunked, and ground with each minute movement. It was literally frightening. The owner clearly thought there was zero wrong with it. I didn’t buy the car, but if I had had the time and maybe $300 in parts for motor mounts and front end work, it probably would have made a decent driver. The engine ran fine. Yeah, they switched or offered the Chevy 2.8 concurrently with the Buick short deck 3.0 sister of the 3.8 in 1985 (I think), then moved the 3.0 with fuel injection to the N bodies exclusively and had the 2.8 Chevy as the mid step engine for the Century and Ciera through 1988, 1989 they replaced all of the V6 options with the 3300. Having owned one with the 307V8, 4 brl carb, and posi-trac would I own one again? Yes with one modification. The engine. The 307 was adequate for its time and certainly not the worst of the smog choked V8s that the Big 3 tried to sell in the 70s and 80s but once speed limits started to rise in the 1990s the engine was woefully out of it’s comfort zone above 65mph and having all 4 barrels open ALL THE TIME on the interstate was not a recipe for serrenity or anything approaching fuel efficency. I used to think the appropriate solution would be an LT1 and matching transmission. Being older and wiser I’d like to try the 3800V6 that GM reoriented for RWD applications in the 1990s Camaro and see if the performance + fuel economy would be a nice blend. But honestly I did LOVE that car and that car is why I shed a tear when Oldsmobile died. I’ll never understand why GM, in the face of relaxed CAFE regulations in the 1980s and $10 oil, didn’t swiftly move to advance cams, EFI, intake and other improvements that only really showed up on the 1996 GMT Vortec and the 1994 B/D LT1. Sunk costs from the 1970s? Trying to redirect customers to the A/W bodies with their more sophisticated platforms and powertrain? Both? I know GM was always a case study in diseconomies of scale. Doesnt sound like we missed much by hot getting these down under GMH moved away from US platforms in the 70s and took on Opels heavily modified for local use but they did still handle well. They used local engines and Opels gutless 1900 . The 6 we had dated back to the EH of 63 and the 253/308 cube V8s were of 60s origin updated for emmisions. When lead got outlawed GM begged the RB30 from Nissan for 1 model then went to the 3800 injected Buick for its mainstream motor which had very good performance out here possibly due to the Commodores weight they were light 1300 kg or there abouts basicly the Caddy Catera but Buick powered insteadof the inline 6 from Opel they were a huge success.A manual Commodore could get 35mpg HWY so not bad on gas either,something must have wrong with US thinking in that GM US made FWD compulsory in stead of making proper cars. These suckers were also available with the unloved 260 V8 for the first couple of model years. I think in contemporary road tests those were even slower than the V6’s. Isn’t that the torque-less 267? We had one in our Impala, I was so disappointed in our first V8 powered car. It made our AMC 258 seem like a rocket ship. Back to the car at hand. My father almost bought one of these. I begged him not to because I couldn’t take all the rectangles, and he relented. Different engine, but the Olds 260 was probably similar in terms of performance, or lack thereof. Pontiac also offered a 265 V8 in 1980-81, which actually was the base engine in Firebird Formulas. The Mustang 260 probably made about 40HP more (net) than the Oldsmobile 260 boat anchor and it was also installed in a car that was considerably lighter than the GM A-bodies of the mid-late 70s. An original V8 Mustang is a rocket ship compared to a 260-powered Cutlass Supreme! I saw an old road test of a 1981 Pontiac Grand Prix with the 265 V-8…either Motortrend or Car & Driver. 0-60 in 14.9 seconds. Ouch! I think the Chevy 267 actually had the most hp of these shrunken V-8’s…maybe as much as 125 hp in a good year? The Olds 260 ranged from 100-110, but I think the Olds might have had a bit more torque. Some of those tiny V-8’s might have actually been slower than the V-6es, because you’d still have the extra weight of a V-8. A car with a 260, 265, or 267 is still going to weigh as much as one with a 307, 301, or 305. A friend of mine once had an ’82 Cutlass Supreme sedan with the 260 V-8. It actually seemed okay in most normal driving. I rode in it a few times. Never saw what it was like under full acceleration, though. Before he bought that Cutlass, he had a ’78 Newport 4-door hardtop with a 400 V-8. Even though the 400 was hardly a rocket, especially in that heavy body, I’m sure that transition was a major culture shock. The 260 Olds was the least powerful of the peanut sized V8 engines of the 1979-1982 time period. These engines prime existence was to combine V8 smoothness with V6 economy which some did an okay job with. The Olds 260 was advertised as an “economy V8” and indeed it got reasonable fuel mileage but sadly would lose with a well tuned up Buick 231 or Chevy 229 V6 in a drag race. In the Cutlass A/G body this engine came only with a lazy 2.29 rear gear unless one insists on trailer towing and special ordering a 2.93 set but finding one like that is virtually impossible today. The 2 problems with this mill was that it added weight over the V6 and made less HP from 1979 onward. By 1981 even the torque was down to 190 FT LBS at a low 1600 RPM’s which is the exact same as the Buick 231. Even still the Olds 260 was tuned for more off idle torque so if one drove both engines side by side the Olds mill still felt a little quicker initially and ran smoother and quieter too. It was when you floored the throttle that the game was given away. The 260 just made more noise with little extra power where the 231 revved out a littler faster and made more thrust. The Chevy 267 in these cars was quicker and so was the Pontiac 265. I owned both in 1981 Grand Prix and 1982 Monte Carlo examples. Both of these engines made up to 20 more Hp and 10-15 extra torque so felt livelier overall. I ended up swapping out the 2 BBL manifold for a 4 BBL setup and swapping to a 3.08 rear gear and that little 267 did a convincing impression of a 305 after that and fuel economy was pretty good too. My Grand Prix was swapped from the 2.29 rear gear to a 2.73 from a G-body wagon by the previous owner and that made a noticeable difference in how that engine performed. This disease spread to the original Chrysler K-cars on the 4-door sedans and wagons, too. Back in December 1977, shortly after this body style first came out, my wife and I (only married for 3 months) went to look for a new car. Her 1970 Mustang was getting tired, and I had recently bought our 1976 Gremlin. Well, guess what? The original version of this body style in Malibu guise on the 4-door sedans had a full-size fixed window in the rear door and a little glass triangular vent in the C pillar. I was appalled at this weight-saving feature – that was the reasoning behind the fixed-glass disease. No deal, ever! Well, we considered a Nova and an Aspen and a Ford Fairmont. No deal either way. The Mustang was kept awake for another 2½ years. We talked it over for about 3 minutes and decided to save our money for a 10% down-payment on a house (you had to do that back then!). One of the wisest decisions I, we ever made, too. Fixed windows…AAAARRRRRGGGGGHHHHHH!!!!!!!! I HATE THEM ALL! Zack, Chrysler quickly saw the error of its ways – the first full model year K-cars had fixed rear door windows with very large vent windows, nearly half the glass was a vent. But mid-way thru the ’82 model year all Ks and their derivatives got roll-down rear door windows. There really was no excuse for GM to do this to their customers, it was just lazy engineering. Typical brilliant GM cost cutting measures. Rear windows often do not roll down all the way anymore; not sure if this is a design compromise for smaller doors or merely insurance against product liability suits. Maybe someone with more inside information can shed light on this. GM could’ve spun these A-body sedans & wagons as being safer for kids in back. In effect, they moved the obsolete vent window to the rear. Modern cars with windows that only go down half way are the result of parents whose children would throw objects or themselves out of fully open windows and blame/sue the carmakers for making the cars unsafe rather than be a real parent and control their mischevious children. It was too much trouble for them to use the rear window lockout button that’s on most 4-door cars from the 90s up. Basically the lawyers made them do it. I could never get behind the chopped off look of these cars. I never ever related them to the 1st gen Seville, either. To me it was just late stage malaise CYA-ing, to keep these cars as a backup in case the FWD versions flopped badly. While I’m probably one in a crowd of about seven who liked the previous ‘aeroback’ GM mids from the late 70’s, these seemed more like caricatures of the successful and practical B body RWD cars from 1977. Someone (probably in Car and Driver) joked that the designers should be brought up on formal charges for the look of these formal roofs. Unfortunately, these were even worse than a flopped FWD A body. Small, underpowered, cramped and IIRC, not inexpensive. Of course, there were precious few alternatives. The Fox body Fords were pretty competent, but the 2.3L Pinto motor was awful in these things. The 200 six was better, but few of these ever seemed to come with V8’s. They doled out seemingly few 302s in the Fairmont/Futura/LTD II versions. The K car derivatives were equally cramped, slow and again not very inexpensive. They really didn’t come into their own until turbos were common across the line. Accords were underpowered, small and expensive, Toyota Cressidas were either the same size or bigger, and similar issues. Datsun Maximas were same size and mission, but more money. VW /Audi really didn’t have competition for this, and MB was way too expensive for this kind of duty. Russian Roulette Oldsmobile style: Cutlass Supreme or Cutlass Ciera? I’ve heard about lawsuits and such being the reasoning behind these windows before, but I think that’s just an old wive’s tale. It was mainly a matter of the windows getting larger and taller, and less space for them to roll down into. If this was something that was mandated, then you would think that it would have been across the board, like when they mandated collapsible steering columns, headrests, shoulder belts, catalytic converters, etc. However, the Mopar F/M bodies, which first debuted as the ’76 Aspen/Volare, and ended as the ’89 Gran Fury/Diplomat/5th Avenue, had rear windows that went down just about all the way. They stuck up maybe 1 1/2 inches in back, and were large, airy windows that a child could easily have fallen through. And on the R-body New Yorker, 1979-81, the back windows went down all the way. They didn’t on the St. Regis, Newport, or Gran Fury; however, the roll down section was larger on those cheaper cars. Now, my uncle told me that back in the old days, sometimes they would make windows stop a few inches short of rolling all the way down in station wagons, to keep kids from hanging their arms out the window. But again, not all wagons were like that…probably just the ones he remembers as a kid. Grandmom and Granddad had a couple of Impala wagons in the 60’s, but nobody can remember the exact years. Either a ’60 or ’61, and then either a ’64 or ’65. I think the windows on the ’64 stuck up a few inches when all the way down, but not sure about the other years. I think the main thing that killed roll-down rear windows was air conditioning. It started with 2-door cars. While we might look back on those days and think of it as cost cutting, the typical buyer at the time had the attitude of “who cares if the back windows roll down or not? It has AIR CONDITIONING! !” And one of my friends, who’s a bit older than me, can remember people rolling up their windows on hot days so that others would think they had a/c. It was definitely a status thing at one time. The feds actually proposed bringing new roll-over standards into play, which hardtops and convertibles would not have been able to pass. This prompted GM to drop all hardtops and convertibles from their redesigned ’73 intermediates, but then the standard never materialized! But, as time went by, a/c got cheaper and cheaper compared to the overall price of the car, and more common, so people just became less concerned about how far the back windows rolled down. Just as long as they rolled down at least part way on the 4-doors! Whether rear windows did or did not roll all the way down into the door was all about the size and shape of the window glass compared with the size and shape of the door. As a kid in the 60s, I sat in the back seats of lots of non a/c cars. A window that did not roll all the way down was a major demerit on a car to me. Some did and some didn’t. Those early 60s GM station wagons with those big rectangular windows would never clear the dogleg for the rear wheel. Certain 4 door hardtops required a roofline that made for smaller door glass in back, or those Ford triangles/kickups at the rear of the door in order to get the glass all the way down. I always thought the ’56 Mopar 4-door hardtops were pretty cool. Mopar couldn’t afford to do a dedicated roofline for the 4-door hardtops, so they just took the 4-door sedan and knocked out the B-pillar and window frames. 4-door pillared sedans used a quarter window in the back door. So, to account for that, they set it up so that when you rolled down the back window, the quarter window was attached to it, and it would pivot down, out of sight. The whole setup wasn’t too reliable, and would let in air and water leaks. But it was way cool to watch! I was also impressed by the likes of the ’71-76 GM and ’74-78 Mopar 4-door hardtops, both of which had relatively large glass area, so it probably took a bit of effort to get those windows to roll down all the way. And even then, I remember on the GM C-body, and the B-body once they squared off the roofline a bit, a small triangular piece of window still stuck up. Ah, my (screen)namesake! What was it about these cars that always warmed my heart? Looking back I would have to say that I personally liked how it provided much of the luxury, ride and style of a full size car but in a more manageable package. I remember as a kid back in the 80’s when my parents had one, a 1986 Supreme Brougham coupe, black with claret red leather and chrome super stock wheels (what a looker!). I was hardly the most popular kid in school, but whenever I was dropped off in front of the school in that car, even the snootiest of kids would nod approvingly in my direction. Even back then, Oldsmobile still meant something, and that is what I loved about it. Recently I acquired a rather pristine 1995 Buick LeSabre Limited, and one of the things that I love about it is how much it reminds me of the 1987 Supreme Brougham I had once (see my avatar). Very close in size, and just as luxurious. Sure, it’s a throwback to the Great Brougham Epoch, but that’s what I love about it. My wife had 1983 4-door model in that omnipresent maroon color that afflicted about a third of the Cutlasses of that time. She drove that thing before I finally brought back the family’s Lincoln Mark VI from the dead. My then girlfriend, myself, three of her younger siblings and myself all picking up my mom and driving her off to meet her family. 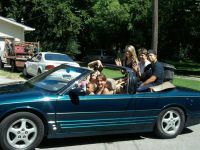 They had seven people in that car (maybe eight) and my mom was used to being around far nicer stuff (Acuras, Cadillacs, Lincolns, etc.) I think the thing smelled like a cross between sweat and kids. Not all that pleasant. I was scared that my mom would think ill of my then girlfriend due to the ragged nature of that beast. 11 years old, no A/C, young kids strewn about, lots of wore off parts and ends strewn about. My mom never told me anything… and I definitely was not about to ask her opinion about it. We took everyone out to a laser show at Stone Mountain Park and it turns out we all had a great time. About a year later the mom replaced the engine with a crate one. Drove it 1500 miles. Sold it. I always thought that was such a fantastic waste. But then again, that car was no better than the Mark VI when it came to fuel economy. Another forgettable POS 70s and 80s style American car. There’s still a ton of them alright…rotting away at Pick n’ Pull. If this is a classic, then so is the Yugo. The fixed rear windows were to save $$, not from a lawsuit. GM didn’t want to admit a mistake and change them. If they were from a lawsuit, all 4 doors now would have fixed windows. I’m looking for one of these need interior parts.Any idea? 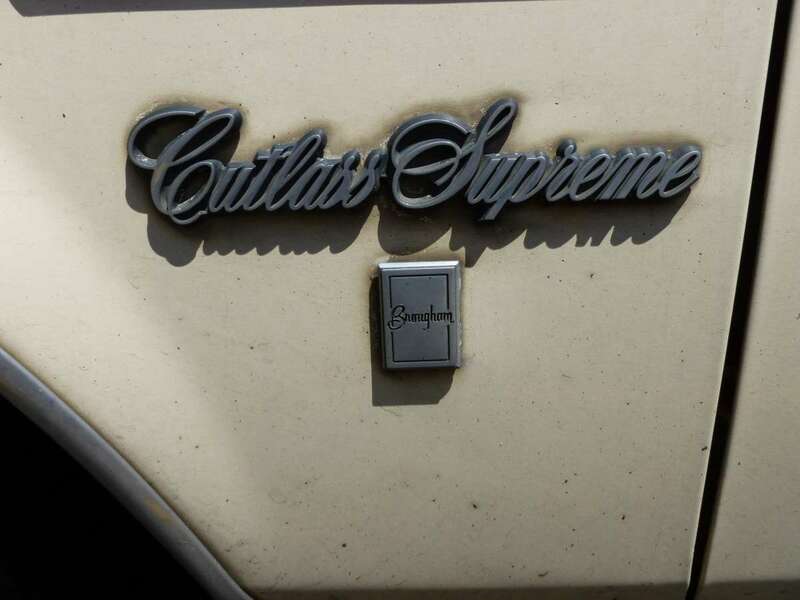 My parents bought an early-production 1982 Cutlass Supreme 4 door that said Supreme on the exterior trim, and LS on all of the interior trim. I believe LS was the 1981 trim level, so GM must have been using up leftover parts. Padded vinyl top, body color sport mirrors, body colored sport wheels, great color called Dark Redwood metallic…browner than the normal maroon color, I think it might have been 1982-only. Nice enough car, cheap mini-Cadillac. I always noticed that when the redesigned 1980 Oldsmobile Cutlass Salon 4 Door Sedan and 1980 Buick Century 4 Door Sedan along with the 1981 Pontiac Le Mans and Chevrolet Malibu versions of these cars were referred to as mini-Sevilles since they do have that 1G pseudo-Seville look, but can they also have that “Nova” look as well? Those versions of the RWD A-Bodies also look very similar to the 1975-79 RWD X-Bodies collectively known as the “NOVA” Group as well. 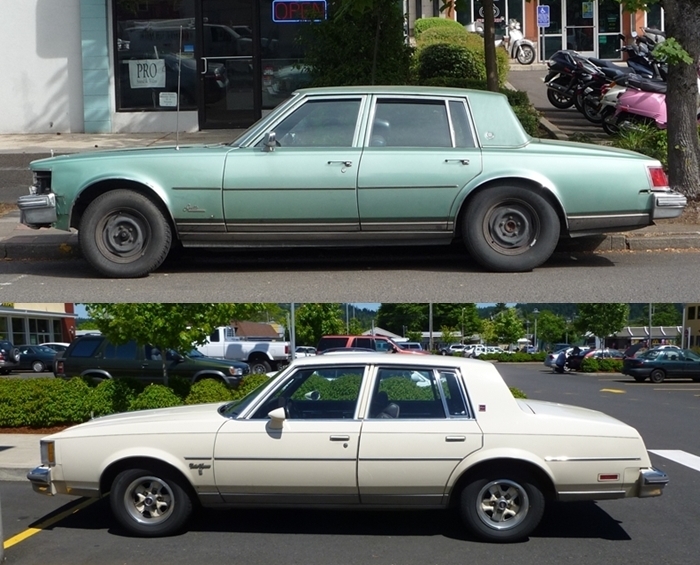 Attached is a side by side photo between a 1978 Oldsmobile Omega 4 Door Sedan pictured from one of your past CC Articles vs. a 1980 Oldsmobile Cutlass Salon 4 Door Sedan. BTW, both cars have almost the same colors and identical in size as well. I saw a well-kept Cutlass of that vintage yesterday. You see them occasionally even here in salt-happy Ontario. It looked like it might have had something other than the original engine under the hood…maybe a modern 3800 or SBC. Still, it was nice to see, and I’d take it over our wheezy old ’78 Gutless. I was never a big fan of these or its Century and Bonneville cousins. They somehow looked too heavy and big for their little wheels. The B bodies carried the look off better. I am loving that Brougham interior though. I suppose the Bonneville would be the rarest of the three? I can’t remember the last time I saw a Pontiac “Bonneville G”, as they were called. They were definitely the rarest, and only built for a few years. Here’s the wagon version – I wouldn’t mind having one of these! GM build about 80-85,000 Bonneville G’s for 1982, and I think that was its best year. Sales tapered off after that, and I think they sold about 40,000 in 1986, its final year. It wasn’t a strong seller, but truth be told, none of those 4-door intermediates were strong sellers after 1981, which was the last year that any of them broke 100K units. It was the personal luxury coupes, especially the Regal and Cutlass Supreme, that were the heavy hitters. However, the ’82 Cutlass Supreme sedan did manage about 60K units for the base model, and 36K for the Brougham. 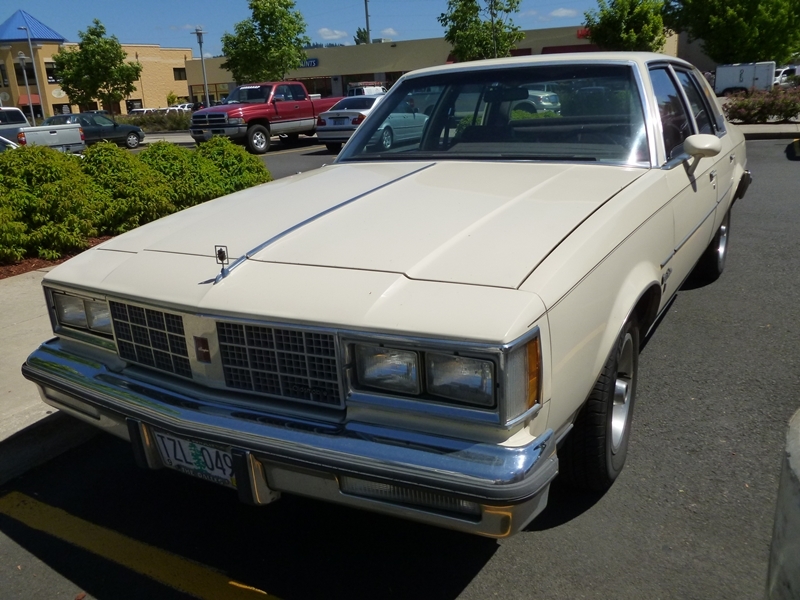 The Century became the Regal sedan/wagon for 1982, the same year the LeMans, minus the coupe, became the Bonneville G. All of the wagons, as well as the Malibu in its entirety, were dropped after 1983. 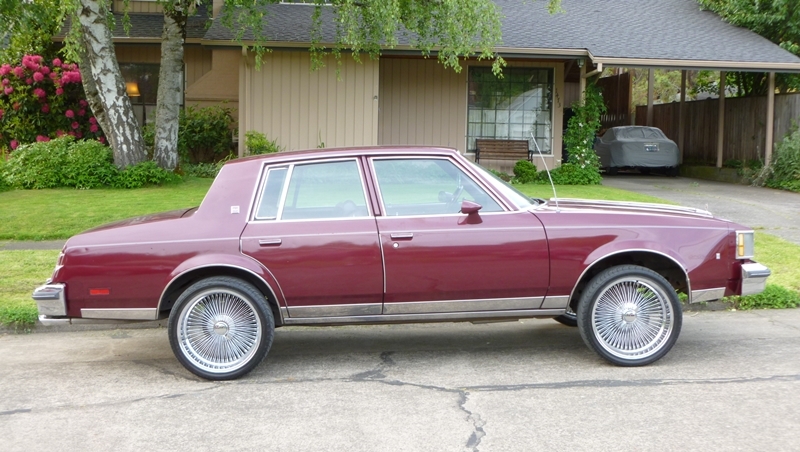 The Regal sedan was dropped after ’84, the Bonneville sedan after ’86, and then the Cutlass Supreme sedan after ’87. “But what’s honesty got to do with this business?” Good question. The “Little Limousine” tag line was for the largely identical Buick Century, starting in 1980, when it lost the disastrous aeroback as well. My first experience with one of these was when my friend’s parents pulled up to drop her off at jr. high for a pre-dawn band trip or something. Black, with maroon loose-y pillow interior, it looked very regal arriving in the dark, opera lamps ablaze. One problem, though, it was making the chugga-chugga-chugga sound of a diesel. That seemed very exotic at the time, but not so much a few years later when it was passed down to my friend and was almost never running. Constantly in the shop, the engine eventually basically exploded or something and they yanked it and replaced it with a gas version. I also had one (non diesel) as a driver’s ed car, which struck me as odd. We had all been expecting beat up cars and instead had brand-new Oldsmobiles and Buicks, including the Ciera, which had just been introduced. Vivid memories of being stuck in the back with those non-lowering windows while a car full of 4 teens and an instructor practiced parallel parking for an hour in an inferno of a parking lot. My brother drove a 1986 Cutlass Sedan, like that yellow one pictured above, as his only daily driver for many years. Unlike the US counterparts, the Canadian cars were equipped with the 305 LG4 Chevrolet. My brother’s car had the LG4 305, TH200-4R trans, F41 suspension, the Olds Rally’s, and the plain non-pillow top interior. He had the wheels painted black, removed the lower body trim, put on wider BFG Radial T/As and true dual exhaust. It actually looked pretty good, much less like a sedate brougham. With the true dual exhaust (sans cats), and some ignition and carb tuning, his car actually was pretty quick. while still got mid 20’s highway MPGs. I remember road testing a US Cutlass sedan with a 307 and it was a turd in comparison. It’d easily blow the doors off my old ’88 Grand Marquis 302 MPFI. Along with the F41 suspension, it actually handled pretty well, and rode fairly firm. My brother still speaks fondly of this old car to this day. I actually saw his old car on the road today, still running. Unfortunately the current owner painted it flat black with a red strip down the middle and added a hood scoop and spoiler. It’s a little rough looking, but still solid. And around here practically all cars from the 1980’s (other than those pampered) are long gone. Even cars from the 90’s are starting to get rare around here. That reminds me of something – weren’t these the car series that got the TH200 transmission “by mistake” or simply by the line running out of TH350’s, followed by the short transmission life due to the engine being too much for it? Sort of like the modern Honda V6/automatic combo. I do like these cars, but I’m one of the few weirdos who likes the aerobacks better. 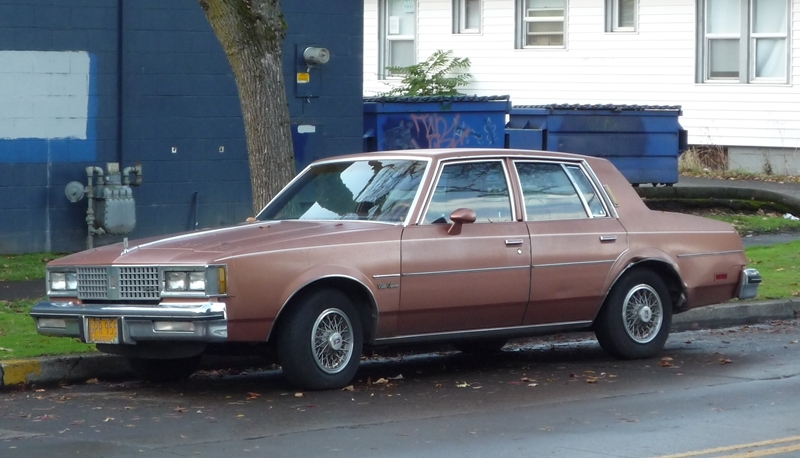 1980 was the year that GM started getting really frumpy and really falling in love with formal roof old timey-ness. When I think of any G-body, the word that comes to mind is “lazy”. They are cars that aren’t in a rush to do anything: warm-up, turn, accelerate, stop, etc. They’re more accurately “comfortably numb” rather than just plain “comfortable”. I think both GM and Ford dropped the ball by dumping RWD in this size during the 80s. They got out of the game right as BMW and Mercedes were set to dominate the world with similar-sized sedans. But it really would have taken this platform a lot to get up to snuff. I owned 2-door versions of both Ford and GM offerings, and in its highest form, the Fox-body was on par with some of Europe’s best efforts. The G-body at its best was a muscle car with a feedback carbed V8. But like I said, I do like them. They’re the last of the RWD GM midsizers, after all, and they do look good. For all their flaws, they still have a presence and charm that almost all of their replacements lack. From a modern perspective, they’re simple machines with lots of parts interchangeability between models, and with every year that goes by they look more and more unique. You can still get one cheap and build it any way you want, just like all the greats from the classic era. Even now, they still make good daily drivers, good weekend cruisers and good race cars – they’re really the last ’55 Chevy that will ever exist. +1 on paragraphs two and three. Those “Aero” Cutlasses-especially the 4 door were just plain fugly.They reminded me of a Daschund-one of those German sausage dogs. 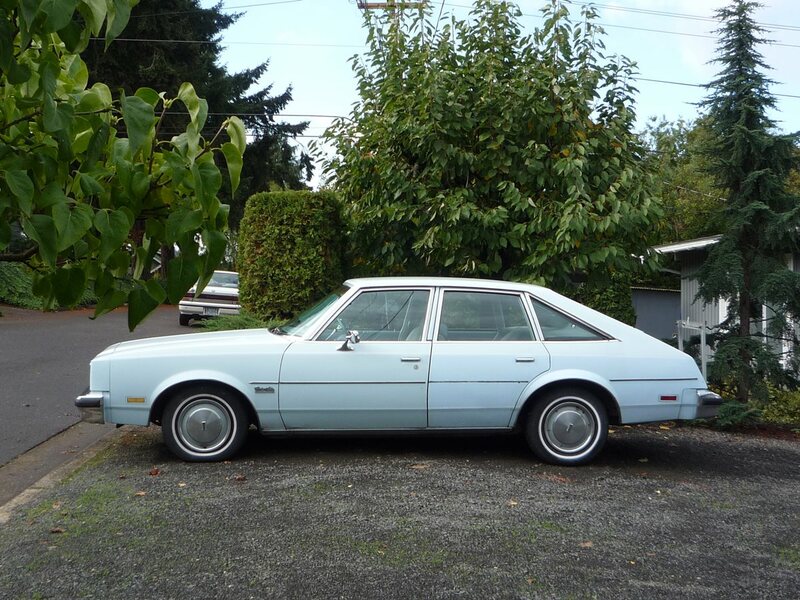 I drove a loaded version in Supreme trim (non brougham and no vinyl top). It was a decent car car for the times. (But, we were a B family at the time and it seemed way too small). Not sure what engine, it was a rental and we were were in LA on vacation. My dad had a medical emergency and my mom had to hand me the keys after an ambulance took my dad from the hotel. 16 year old kid from flyover country on an 8 lane freeway in a rental. I was an Oldsmobile guy, eventually a two Cutlass owner and an 88 coupe. The car delivered on a bad day. No complaints here. Context is everything. I used to think some of the Seville’s wheelbase stretch went to the front but folks here convinced me that it did not. Here I’m comparing this A-Body to the Seville, but in a very generalized way, as these two cars don’t really have anything in common in terms of their platforms. It was not meant to be taken literally, just an off-the cuff observation. I think some of the Seville’s stretch, compared to the Nova, might have been in front, to give it a longer hood/fenders, but the back doors were also stretched a few inches. In terms of interior volume, the Seville is actually slightly SMALLER inside than the Nova! According to the EPA, a ’75-79 Seville has 95 cubic feet of passenger volume, compared to 96 for the Nova. One thing that might make a difference is that the Seville would have thicker seats, and plusher door panels, so that would definitely cut into shoulder room. And even if the back seat was moved rearward, if the seats are thicker, legroom might still end up being reduced. The Nova platform in general wasn’t very space efficient, because GM had decided to use it for both the 1968-79 compact cars and the upcoming 1970 Camaro/Firebird. As a result, they had somewhat long hoods and fairly small passenger cabins. I think it gave them really nice proportions though, especially the ’75-79 Novas. You are correct indeed because the width of the 1975-79 Nova was measured at 72.2″ while the Seville had a slightly smidgen of a width narrower by 71.8″. Although such a miniscule difference should be negligible because another Nova based car the 1974-81 Camaro depending upon the year made had widths of 74.4″ and 74.5″ and yet these did not help matter in terms of more hip room compared to the Nova since the interior volume of the Camaro was still cramped compared to the Nova. I think Camaros of the ’70-81 vintage were actually pretty wide inside, at least up front. Something like 58″ of shoulder room? For some reason, the number 56.7″ is sticking in my mind for the Nova, and around 54.5 for the Seville. However, those EPA interior volumes are a combination of shoulder room, legroom, and headroom, for both front and rear. A Camaro would have a lot less headroom, not to mention a tiny back seat. You were essentially sitting between the wheel housings back there, so shoulder room was sparse. So, a Camaro would have a lot less interior volume, overall, than a Nova or Seville, even if it had more shoulder room in the front seat. Now that I think about it, the Nova’s relatively generous amount of shoulder room, for a compact, might have been one reason GM hollowed out those door panels on their intermediate cars. IIRC, the 4-door models had about 57.5″ up front and 57.0 in the back, and coupes were about 57″ up front and 55.5″ in back. I believe the Nova sedan was 56.7″ front and rear, but not sure about the coupe. The Malibu and company would have been notably wider than most compacts, as the Aspen/Volare had 56″ of shoulder room, and the Granada was only around 54-55″. I think the Fairmont was around 56 as well. But with the Nova being on the upper end of compact range for shoulder room, maybe GM figured they had to go a bit further with the midsized cars, to give them more of an advantage compared to the compacts. Speaking of the RWD A/G- Bodies made between 1978-79, the consequential effects of its downsizing made it more competitive to the identical sized but otherwise different RWD X-Bodies. Since those were the popular sizes for automobiles during that time, GM actually had planned obsolences in mind for the Nova and its other GM Cousins in 1978 even though the redesigned bodies were only three years old during that time. It sure worked because by that time, the Malibu were eating away sales from the Nova and GM had intended it that way to justify the short model run for the Nova Group through late 1978 for the abbreviated 1979 model run. In addition, you will also notice that Chevrolet decided to release their redesigned Malibu Sedan in 1981 which was two years after the Nova was discontinued to even further avoid Malibus “cannibalizing” Nova sales and see how much closely similar both have became now. The ones built by GM Canada in Oshawa were also the export models, so they were built by some of GM’s best workers. Materials were very nice, especially in the later ones. The LG4 cars were very peppy and they all had FE3, at least the ones I saw. Many were exported to the Middle East. The cars drive very nicely and were very comfortable.